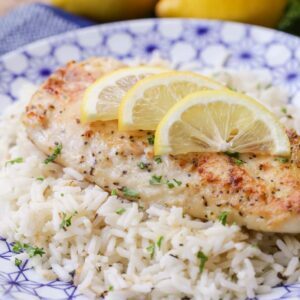 Flavorful and tender Lemon Pepper Chicken is a delicious chicken recipe that is simple and requires just a few ingredients. Served on it’s own or over rice, this chicken dish is buttery and perfect any night of the week for a simple, quick dinner idea. You know those days when everything goes wrong, your kids are driving you bonkers, and you have no idea what you’re going to cook for dinner? I know them all too well. The last thing I want to do during a day like that is spend more than one minute thinking about dinner. That’s when you remember this grilled lemon pepper chicken. 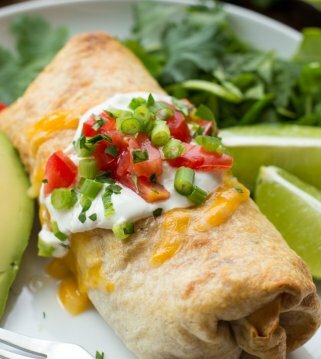 Thank goodness for simple no-fuss recipes that are full of delicious flavor! ???? You may not be familiar with lemon pepper – the seasoning – but it’s one that can add so much flavor to a recipe (especially this chicken dish). Today’s Lemon Pepper Chicken is coated in a little flour mixed with the lemon pepper seasoning. That gives the chicken a tasty crispy layer on the outside. After sautéing the chicken breasts in butter, they are juicy and moist inside. Chicken perfection! 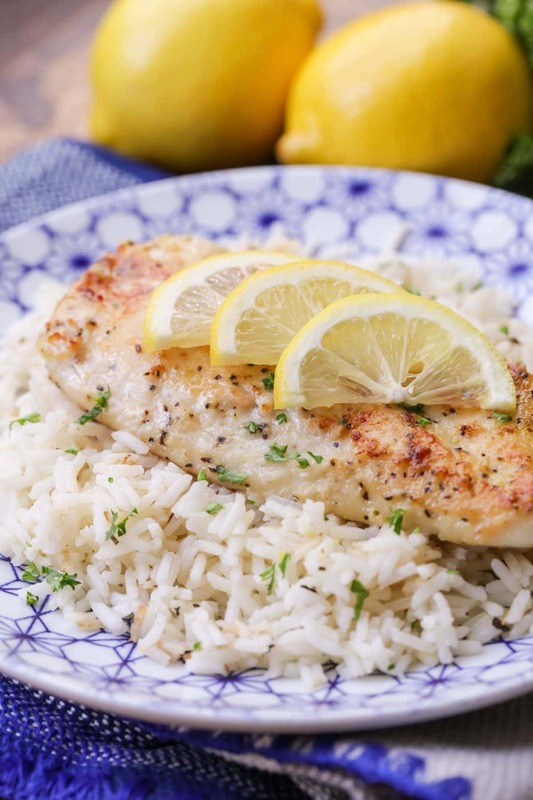 There are about 2 steps to make this lemon pepper chicken- it’s THAT easy. You’ll definitely need the McCormick Perfect Pinch Lemon & Pepper seasoning. You can find it at almost any grocery store. It’s cheap and will last you forever. It’s goes well with so many different recipes. Mix your flour and lemon pepper seasoning together in a shallow dish. I like to use a cake pan or pie dish for this step. 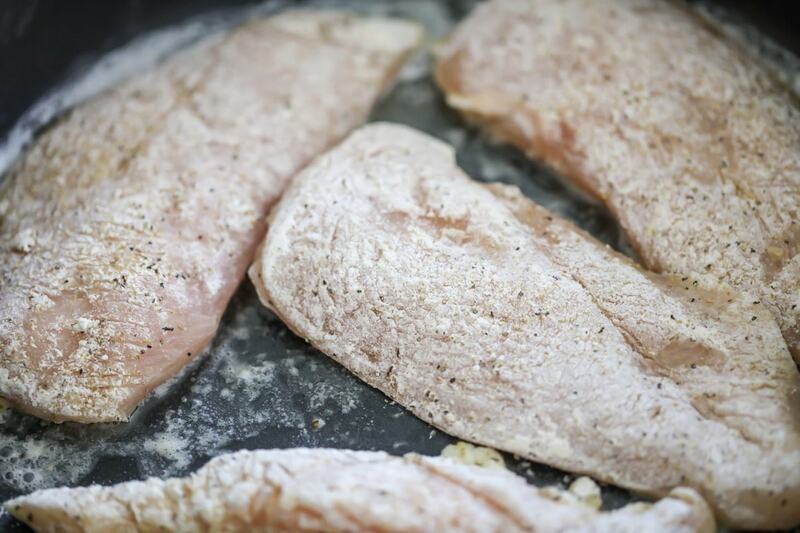 Take your damp chicken breasts and coat them in the flour and seasoning mixture. Put them aside while you heat up your skillet over medium heat. Cook the chicken in 2 tablespoons of butter and listen to it sizzle. I love that sound, don’t you? Cook your chicken until both sides are a golden brown and cooked through. This will usually be about 3-4 minutes on each side. 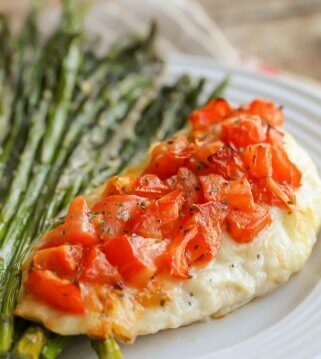 Serve it with a few slices of lemon and your favorite rice! 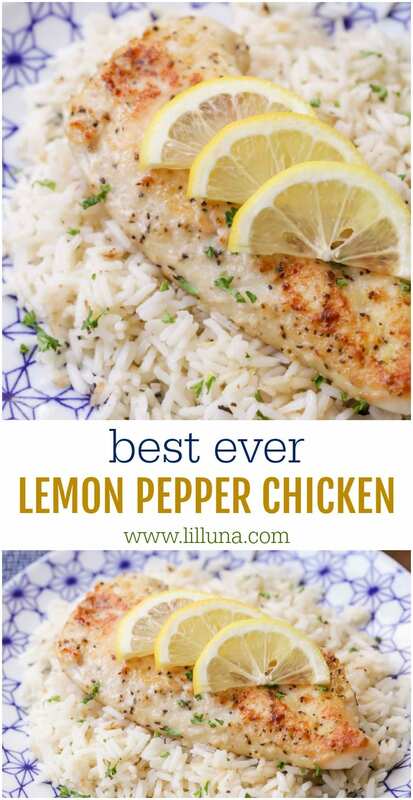 Let us know if you are going to try this lemon pepper chicken recipe and how you liked it! 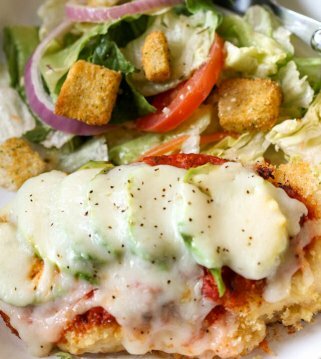 It’s so yummy and simple – I will probably make it for dinner tonight! Flavorful and tender Lemon Pepper Chicken is a delicious chicken recipe that is simple and requires just a few ingredients. 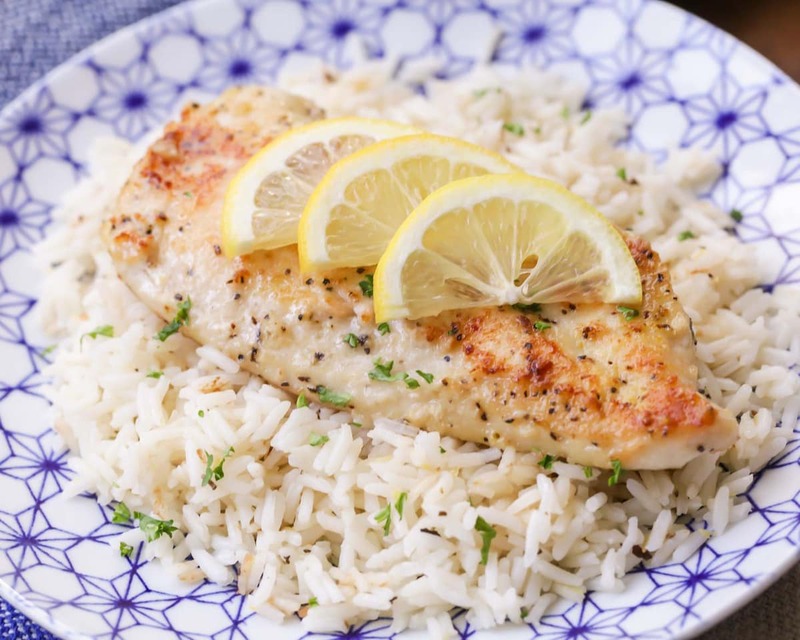 Served on it's own or over rice, this chicken dish is buttery and perfect any night of the week for a simple, quick dinner idea. In a shallow dish, mix Lemon Pepper Seasoning and flour. Evenly coat damp chicken with seasoned flour. In a large skillet over medium heat, melt your 2 tablespoons of butter. Cook chicken over butter until both sides are golden and cooked through, about 3-4 minutes on each side. Continue until all chicken is cooked, add additional butter if necessary. You are great. Thank you for all your wonderful recipes.